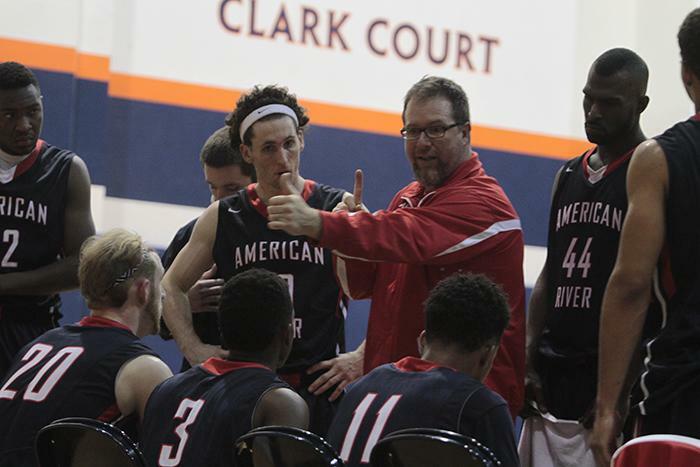 American River College men’s basketball team fell to Cosumnes River College 79-63 Tuesday night, as CRC’s staggering full court press defense and shooting 50 percent from the 3-point line was too much for ARC to handle. It was the seventh straight win for CRC, which improved to 17-7 overall, while ARC dropped to 13-7. ARC made a push late in the second half after a momentum-changing steal by guard Tyrone Potts. ARC went on a 8-0 scoring run, trimming the lead to single digits for the first time in the second half. CRC jumped out early in the first half with a 10 point lead at 17-7. ARC’s shooting was slow to get going for entirety of the first half, and its defense wasn’t much better. “It’s all about how you mentally prepare”, said ARC head coach Mark Giorgi. “If they were that good mentally, half the guys wouldn’t be here. They’re good players,” he said. CRC’s center Donald Mims had 5 blocks to add to his 12 rebounds and nine points for the game. ARC was left a little short-handed Tuesday night. Center Eugene Crockett played limited minutes due to a stomach virus. CRC guard Phil Randles went 6-12 from the field and 3-5 from the 3-point line, as CRC was up by as much as 21 points in the second half. “Their big guys were killing ours early, (Randles) hit a few threes that really killed us,” said Potts on what made them run away with the lead. Be the first to comment on "CRC takes big lead, defeats ARC 79-63"